Ein Fiddle Yard ist nicht, wie vielen denken, etwas nur für sehr grosse Modellbahnen und Ausstellungen usw. braucht Fiddle yard viel weiniger Platz. und eine Herzabstand von Gleisen von 40 mm (HO) , spart man sehr viel Platz. So eine Fiddle Yard machtmehr als 50% Reduktion in Platz, im Vergleich mit Schattenbahnhof. Und mit z.B 12 Gleise, braucht man in Schattenbahnhof 22 Weichen (mit Antrieb und Steuerung). habe ich 27,6 Meter Schienen! in meinem alternatieve Schattenbahnof. Und das alles auf eine Raum von ca 2,4 Meter x 0,9 M (Inclusief frei Raum zum Bewegung). Meine erste Fiddle Yard hat seine Alter erreicht. Nach 8 Jahren von viele Ausstellungen, aufbauen und wieder zurück nach Clubhaus brinden, viel kleine Fehler waren ein Erfolg. MGV's 2-Schienebahn. Aber diese lange Zeit von Benutzung hat auch viele Sachen gelernt. Also hier ist jetzt die Schritt zu Schritt aufbau einerneue Fiddle Yard. Aussen Abmessungen sind fast gleich wie vorher, damit es passt mit die andere Modulen. entweder horizontal oder vertikal, 1, 0, G, HO, N oder Z Schienen. Ein Tisch (transportabel oder nicht), eventuell mit klappbare Beine zum Transport. Elektronisches System für die Bewegungsregelung. Mechanische Aufbau mit Schiebebühne und Schienenkontakt Schleifer. Mechanisch Antrieb mit Schrittmotor und alle weitere Teile. For this new FY there is also a new concept to move it. The concept is explained in many details in http://wiki.rocrail.net/doku.php?id=gca145-en . That unit, suitable of controlling a stepper motor , and a solid drive set to connect the motor to the moving part of the FY, is all we need. This picture shows the basic table. 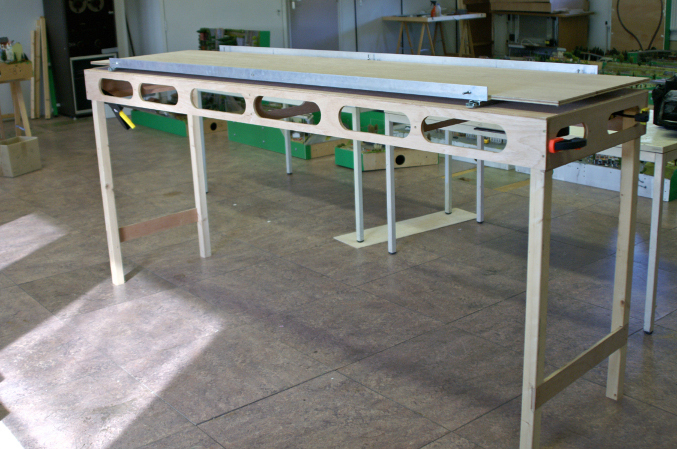 It will have a leg in each corner which can be folded and locked in the bottom, for easier transport and installation. On top is the sliding part. It is fixed on three drawer rails from an old metal office desk. Some minor changes had to be made to these sliders, to make it possible to slide both ways (desk drawers only come out on one side!). 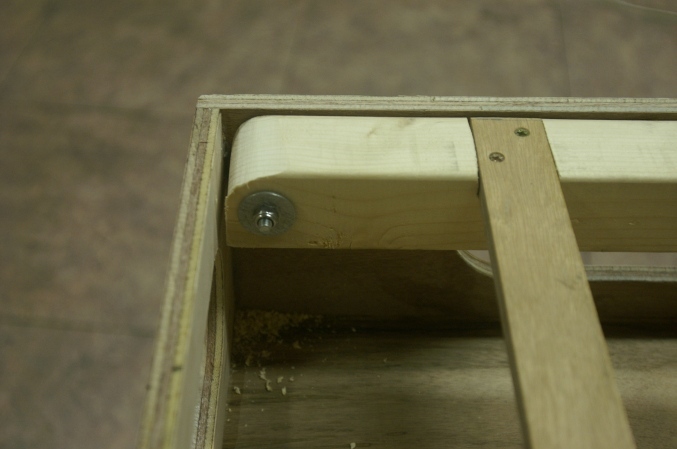 Important to mention is that these sliders should be mounted in absolute parallel position to ease the sliding. In all triplex 12 mm plates I made a lot of holes, and so cutting down the total weight. With a bolt and nut and a little pipe inside the leg, there is good turning point to make transport and building up as easy as possible. The mechanical base is made with the gear wheel set, as remarked in the MGV145 page. Using a rather strong steppermotor out of an old large tractor feed printer, it provides a nice slow and powerful engine to move the whole 2300 mm table. These pictures show how it looks. The motoraxle is connected to the gear wheel axle by means of a rubber tube (green part), to suppress the vibration which is generated by the motor. In addition a ball is slid in the middle of the tube to make it more effective. The motor is also mounted in 4 rubber tules, for the same reason. A tooth belt (together with the appropriate wheels also ordered from Conrad), will be cut and connected to both sides of the fiddle yard sledge. To make it possible to fine adjust the position of the axle, holding the large gear- and belt wheel, the ballbearings are mounted with a plate and three bolts and nuts, so they can be slid to adjust. It is important to make the 'free moving space' as small as possible. In this example there was almost none. The 12 tracks each have 3 contact sections, to inform the computer program about the position of a train. That means 36 contacts in total. I like to combine this to only three contacts at all, meaning that I have to switch from one rail to the other. Rocrail, as the most ideal program for this, is made to do it that way. But using relays to switch all these contacts is much more complicated than the needed feed-back hardware. So, another solution, in a typical modelrailroad way, is created. I had to strip an old Maerklin coach from ist wheel sets, and use these to ride upside down over a rail, as long as the width of the moving part of the FY. The picture explains this clearly. The rails move with the FY slider, and the wheelsets are stationary, fixed to an alu strip with a spring, to be sure it contacts correctly. This the wheelset (including ugly slider), providing a double contact switcher with 12 positions. The three rails are soldered on a Pcboard, and after that, all cut in 12 pieces including the copper layer, but leaving the pcboard in one piece. The FY is equipped with two of those slider sets, giving in total a 4-pole switch with 12 positions. All four contacts are connected to GCA145 (three for rail sections and 1 for midrail (or left side in 2 rail systems). These contacts could also be connected to separate feed-back unit like GCA93. Because this fiddle yard is moved with a rather low speed, the power is pretty high. And because this fiddle yard will be exposed in public on shows, it could be harmful for anyone who is getting too close to the moving table, specially for children. one or more little curious hands are too close. This is done by a conducting strip along the side of the front, with a steel wire close to it. Touching this wire will immediately stop the engine. Resetting is only possible from the side that is not accessible for public. The strip is connected to boards ground( ICSP1 pin5) and the steel wire is connected to ICSP1 pin 3).